WBZ is reporting that a barge struck and damaged the Beverly Draw and its been closed. The MBTA is urging riders north of Salem on the Newburyport/Rockport lines to use alternate modes. The news reports this morning first said that a bus diversion was in place between Beverly and Salem, then that there was no service at all (this was about 6:45 am). 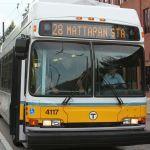 octr202 wrote: The news reports this morning first said that a bus diversion was in place between Beverly and Salem, then that there was no service at all (this was about 6:45 am). Those sets would not have been trapped... the 353 is a turn of the earlier Anderson shuttle 352, and the 355 is a turn of a previous Lowell inbound, the 306. But perhaps you are correct in guessing they diverted the sets to provide inbound service from Salem. Inspectors at the scene are "very confident" the bridge can be locked into position so train service can be restored for the evening commute, [s]aid MBTA spokesman Joe Pesaturo. I was told(from an MBCR manager) they were going to "walk" a train through around 10am. If there weren't anymore problems they would do that for the remainder of the day. I was also told there could possibly be busing on Saturday morning to finish the repairs. Commuters are urged to drive to the Wonderland Blue Line station in Revere or to the Anderson commuter rail station in Woburn on the Lowell commuter line. Both stations have plenty of parking, Pesaturo said. Another alternative would be driving to Central Square in Lynn, parking in a public garage, and taking a bus to the Blue Line or into Boston. So those of you who rely on public transportation because you don't drive, are worthless to us. If there are trains 'stuck' north of the bridge, why not run them, and have a bus shuttle between Beverly and Salem? It's not that easy to create shuttle trains on the other side. Most crews do not stay on one line, so who is going to run these trains. Or who will run their trips on the other lines? The other thing is fuel. Most of these trains are normally fueled during the day for evening rush hour and wont make it through evening rush hour without seeing BET. 10 minutes away from almost certain disaster. As of 1:15p the trains have resumed operations. Looks like emergency repairs will be made tomorrow. WHDH has a somewhat more detailed report than other places. The video report has more detail than the printed story. Apparently the barge hit twice, once last night and again this morning, but only inflicted damage this morning. I sure hope they sack whoever was operating that barge. Someone I work with lives in Salem. She said she waited waited a little over an hour for a train yesterday morning. She was told (at first) that there was a train coming in 10 mins but also that she should wait in the bus since it would be warmer in there. I would've taken that as a hint that I might be waiting a little longer than 10 mins So the train she eventually got on, must have come from BET or something, right? sery2831 wrote: It's not that easy to create shuttle trains on the other side. Most crews do not stay on one line, so who is going to run these trains. Or who will run their trips on the other lines? The other thing is fuel. Most of these trains are normally fueled during the day for evening rush hour and wont make it through evening rush hour without seeing BET. You could get a fuel truck at the two outside points and hire 2 spare crews to run 2 trains between the 3 points. That's probably how I'd want to do it if I were running the show. The part that really stings though is the fact that because one 50 foot section of double track is out the system is now down 8 train sets. That right there is enough to get me to start looking for new solutions. MBTA3247 wrote: I sure hope they sack whoever was operating that barge. Yes, and then his family has to worry about getting through the holidays with the lost income, all because some idiot crashed his vessel into the bridge the guy was in charge of. concordgirl wrote: Someone I work with lives in Salem. She said she waited waited a little over an hour for a train yesterday morning. She was told (at first) that there was a train coming in 10 mins but also that she should wait in the bus since it would be warmer in there. I would've taken that as a hint that I might be waiting a little longer than 10 mins Wink So the train she eventually got on, must have come from BET or something, right? Either that or another line. The trains that layover at BET go to Lowell in the morning, and one goes to Haverhill. I'm not sure what they have in terms of spares that they can send out to other places. But I'm sure there was no such thing as business as usual that morning anyway so I don't know. I think you misread; nobody said that the bridge operator should be sacked.